Rhode Island Governor Gina Raimondo unveiled Thursday a $9.9 billion budget proposal that directs more money to education, legalizes marijuana for adults and avoids broad-based tax increases. The spending plan also wipes out an almost $200 million deficit, while imposing some new fees. The executive summary of the budget describes the spending plan as an effort to strengthen Rhode Island’s economy for the future through a new emphasis on different levels of education, “a reinvestment strategy” for state parks, and an attempt to stabilize the Affordable Care Act. The budget banks on new revenue from sports betting ($30 million), legalizing marijuana for adult use (an initial $6.5 million, growing to more than three times that revenue in the second year of implementation) and imposing a new assessment on for-profit firms with more than 300 employees for each worker who is enrolled in Medicaid ($15.6 million). It remains unclear how the governor’s proposals will fare in the General Assembly, which will hold months of hearings on her ideas and pass a revised budget, probably in June. Republicans say Raimondo’s budget includes too many giveaways. In total funds, the governor is proposing that the state spend $9.93 billion in fiscal 2020, a $358 million increase from the budget passed by the General Assembly last year. More than $4 billion of the budget would come from state general revenue – an uptick of $168 million – while $3.3 billion would come from federal funds, $301 million from restricted receipt accounts, $240 from transfers, and a bit less than $2 billion from other funds. Raimondo’s budget hikes cigarette taxes 25 cents per pack, imposes a new tax on cigars and expands the sales tax to include lobbying and a few other professions, as well as digital downloads of services like Netflix. The state is also considering fee hikes at state campgrounds and beaches, although the details have not yet been settled. “We’re not committing to increases, but we’re not ruling them out,” said state Department of Environmental Management spokesman Michael Healey. The spending plan calls creating a business development office to solicit park sponsorships, partnerships and donations. The budget proposed a hike in the minimum wage, from $10.50 to $11.10 an hour. A new initiative proposes that cities and towns would be able to collect $150 million each year in additional property tax revenue through enabling legislation giving municipalities the option of taxing “the non-mission property” (such as leased space for a coffee shop or doctor’s office) of tax-exempt non-profit hospitals and universities. Some Rhode Islanders would get less car tax relief in the fiscal year stating July first, due what state officials call the smoothing of an unanticipated spike in the cost of eliminating the car tax over multiple years. The car tax phaseout championed by House Speaker Nick Mattiello was first approved in 2017. Smiley says the total phaseout remains on track for 2024. The state is compensating cities and towns for their gradual loss of car tax revenue. That figure is ultimately expected to grow to more than $200 million each year. Smiley said Mattiello has been briefed on the proposed change in the car tax, and was pleased that the change would not affect the timetable for completely phasing out the tax. Legislative leaders were noncommittal Tuesday, following Raimondo’s State of the State speech, about supporting the governor’s expansion of the free college tuition program and the proposed legalization of marijuana. But Smiley said he’s optimistic that the legislature will support the governor’s priorities on education. “We believe that the investments that we’ve made in K-12, pre-K and the Rhode Island Promise program are some of the best investments that we’ve made,” he said. “We know that the legislature hears from their constituents. Every legislator has a family that’s been touched by pre-K or Rhode Island Promise, and so we’re confident that those voices will be heard this year as the budget is considered." In a statement, Senate Finance Chairman William Conley (D-East Providence) said, “The Governor’s budget proposal reflects leadership that is not afraid to tackle the difficult challenges and take bold action to invest in Rhode Island’s future. It invests in many areas prioritized by the Senate, including education, economic development, and human services. Even as we think boldly, however, we also must be cognizant of the short-term revenue fixes and long-term structural deficit. There will come a time when the economy is not firing on all cylinders, and we need to ensure Rhode Island is positioned for resiliency. The spending plan wipes out an earlier $45.1 million deficit for the current fiscal year through a combination of expenditure changes, debt service adjustments, and transfers of funds, or “scoops,” from other agencies. 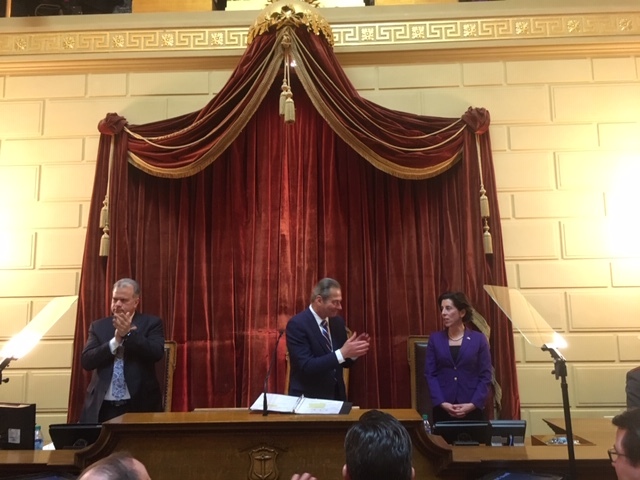 What had been a $157.8 million deficit for the fiscal year starting July 1 was eliminated in Raimondo’s budget through new revenue, updated caseloads for state social program, expenditure changes and transfers. Raimondo chatting with Senate President Dominick Ruggerio after her State of the State speech this week. House Speaker Nicholas Mattiello is at left. 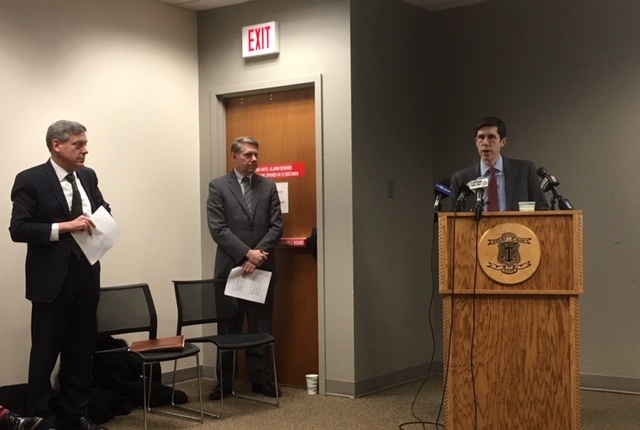 Raimondo Chief of Staff Brett Smiley (at podium) briefs reporters while Managment and Budget head Jonathan Womer and Budget Officer Tom Mullaney listen.